Countless examples can be found throughout the history of great art that was only recognized as such after the life of the artist that created it. Such is true of Georges Bizet’s opera "Carmen." While its reception during his lifetime could be arguably be referred to as ‘lukewarm’, it went on to become of the most widely performed and recognized works in the opera repertoire. One would think that a story of love, jealousy, revenge, and a fiery femme fatale would have perennial appeal, but Bizet’s down-to-earth realism and portrayal of such a strong-willed woman scandalized audiences in his time. Despite the action of the opera being set in Seville, Spain, the opera’s libretto is actually in Bizet’s native tongue of French, so it only made sense for such a momentous production put on by FM Opera to actually bring on a stage director from France, the acclaimed Maria Todaro. 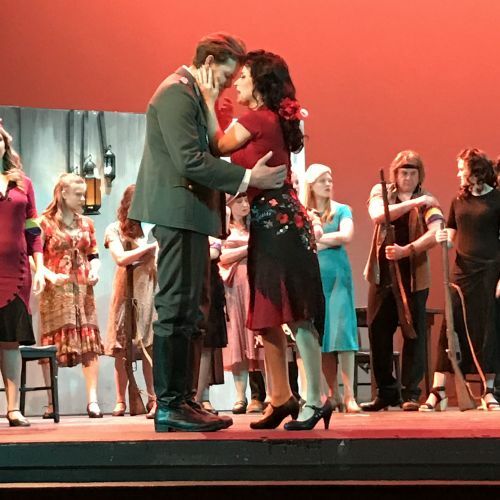 In this production of Carmen, she updates the backdrop of the opera from the late 1870s of the original production to the 1930s, in the midst of the Spanish Civil War. “This is a more feminist take on Carmen,” said Hamilton, which is perhaps only fitting considering that "Carmen" is arguably one of the foremost portrayals in opera of a strong-willed woman who refuses to let any man control her life. “It’s a powerful story. I think people will enjoy how immediately relatable this updating of the production is,” Hamilton added. The opera will be sung in its original French, with subtitles projected above the stage. This production will also include unsung dialogue, or recitatif, like the original production, which Hamilton said helps move the narrative along. The opera concerns the titular Carmen, a sultry, free-spirited femme fatale who catches the eye of the soldier Don Jose. Don Jose, over the course of the narrative, becomes so entranced by her beauty and vitality that he forgets not only his vows to the woman he originally promised himself to, the meek Micaela, a village maiden, but also to the army, leading him to be thrown in jail on Carmen’s behalf when he lets her escape arrest after causing a disturbance at the cigarette factory she works at. When he is let out two months later, he is still so in thrall to Carmen that he assaults his superior officer, deserts the army, and joins the gypsy band that Carmen helps smuggle contraband. However, he soon finds himself jilted as a virile young bullfighter named Escamillo starts to win Carmen’s affections. Don Jose’s all-consuming jealousy leads him to pursue Carmen and brings on the shocking act that ends the opera. The role of the titular character in FM Opera’s 50th anniversary performance is played by Hilary Ginther, has previously worked with them when she was part of the Gate City Bank Young Artist Program about six years ago. All of 2019’s Young Artist Program members are also in this production, as well. The rest of the cast is comprised of performers both from this area and around the country, including the famed conductor Eric Weimer from Chicago. Our own Fargo-Moorhead Symphony Orchestra will provide the instrumentation. Even those who have never seen Carmen are bound to recognize several pieces of music from it because of their wide use in other media, such as television and film. Such pieces include the famous “Habanera”, “The Toreador’s Song”, and “Seguidilla”. It is a story that contains the ever-popular subject matter of love and jealousy and the lengths to which it will drive people, making it a great piece for a neophyte to dip their toe into the expansive world of opera.